A family owned operation that prepares happy healthy puppies for you! News from a snowy hilltop! Over the weekend it snowed a bit here in Iowa. This meant snow piles from cleaning out the driveway and that always means sledding! Kenai got to enjoy chasing Brooke (granddaughter) up and down the hill. Kenai will be going to a new home soon and we will miss him. It is that time of year when the puppies go to their new homes. It i s a bittersweet time. We spend a lot of time loving these little ones and then we send them off to be loved by someone else. In our past we have had puppies go for police training, therapy dogs, sledding dogs, and many lovable companions. It is an honor to share these babies with you. Bringing up smart puppies is my favorite work on the farm, but not my only work. I also spend a majority of the winter crafting wooden projects (See image). 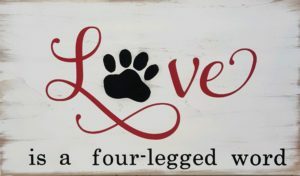 This latest paw print was made as a gift for our veterinarian. We would be lost without her. She always has time for us and has been helpful through every question we have come up with. Today we did a visit to see if we’re ready for another litter of Pomsky puppies. We are a go for our planned Pomsky spring litter!